What do aimless drug addicts and senior citizen diabetics have in common? Needles. Peculiar things really. For the former, they deliver a toxic elixir that bring on delusions of grandeur. Once points pricks the epidermis, the magic carpet ride is swooping in for a take off. For the latter? It is a necessity that brings life despite what could create death. Put the examples together and you get Mary Massa of Brandon, Florida, read about in UK’s Metro. Diabetic Mary Massa… visited her doctor to give two routine blood samples – but was left stunned when she took off her bandage. 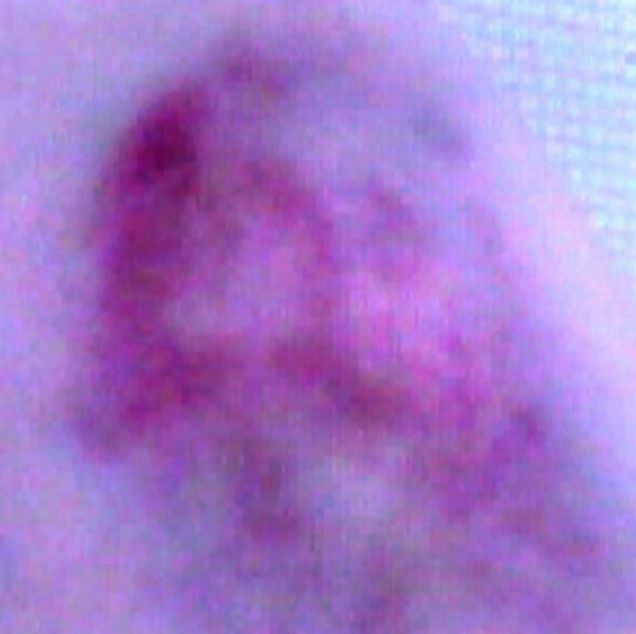 Mary claims she can see the face of Christ in the bruise left behind by the two needle punctures. I suppose this is the best the elderly can do for stigmata? She loses too much of that blood and there goes the day, right? Mary, now jokingly called “Our Lady of The Hematoma” by her family, brags about shaking hands with the Pope and just couldn’t believe her eyes. Neither can the rest of us. No worries. So, that’s why 2012 was such a flop?